As the name suggests, presentation documents are used to organize charts and tables so that you can easily and professionally showcase an overview of your work. The Presentation document window opens outside the application to give you more flexibility for working with, sharing and presenting charts. Charts can be organized by pages and in folders. Get an overview of multiple charts at once. You can make changes to the charts in the application and see this reflected in the presentation document in real-time. The Presentation documents window can be viewed on a second monitor to enhance your ability to work with multiple charts efficiently. Add and organize an unlimited number of charts from different documents in one place. Save presentation documents for your personal use or for sharing with others. You can browse through the pages using the Page Down and Page Up keys on your keyboard. Print or export a presentation document with a number of charts (in this version PDF creation only works on Win10). This will then work as an alternative to PowerPoint. 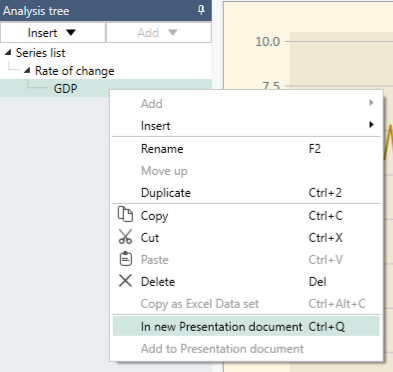 Right click on the analysis tree to open the context menu. Click on In new Presentation document. Click on Add to Presentation document. An alternative to using the previous command is Add to documents. Using this command will allow you to add multiple presentations (charts or tables) at once. However, the default presentation for that document will always be used. You can identify which chart or table is the default by looking at what is displayed in the thumbnail. To add a new presentation from the application select Add documents(s) in the Home view of the menu bar. If there are no presentations in a document, the document will not be added, nor will this result in an error message being displayed. To save a presentation document, click on File, and Save, in the top menu bar. You can save presentation documents in your personal account store or company account store, just like other Macrobond documents. Saving to the company store will allow you to share presentation documents. If you share your presentation document and it contains references to documents in your personal store, you will get a warning that other users might not be able to see all documents in your presentation. To open a presentation document, click on File, and Open in the top menu bar. Select the presentation document you would like to open from the dialogue box that appears. You can distinguish them from other documents by the P in the lower right corner of the thumbnail, or by looking at the information in the tooltip. Click on File, and Print, from the top bar menu. In the print dialog there are options for selecting printer, paper orientation, margins and page range. In Windows 10 there is a built in printer called Microsoft Print to PDF that can be used to create PDF files. To make changes to the charts in your presentation document simply edit them in the application as you normally would. The changes will be automatically reflected in any presentation the edited chart is in. Please note: Any changes made to the original document will be reflected in the presentation document. Charts are not embedded in the presentation documents, but referenced as links to the original documents. There is a list of the charts, like a table of contents, on the left hand side of the presentation. You can change the order of the charts by dragging them with the mouse. A page is used when you want to collect several charts in one view. In the menu bar at the top of the window, select Add page. Drag the charts in the table of contents, on the left, to the page you want to add them to. If you have many charts or pages in a single presentation document, you might want to organize them further into folders. In the menu bar at the top of the window select Add folder. Then drag charts and pages into that folder. You can rename charts, pages and folders in the table of contents by selecting Rename in the context menu, or by pressing F2 on your keyboard. Using the Page Down or Page Up keys on the keyboard will take you to the next/previous page or chart that is not on a page. If you double click on a chart on a page, the chart will be displayed in full size. Backspace on the keyboard or the back button on the mouse will take you back to the page view. This is convenient if you have created a page with many small charts (using a low zoom factor). You can then double click on charts you want to take a closer look easily returning to the previous view. To view the Presentation documents window with a minimized toolbar and overview pane, press Ctrl+M on your keyboard. Alternatively, you can select the View tab of the menu bar, and then click on the button on the left to minimize or maximize the toolbar. 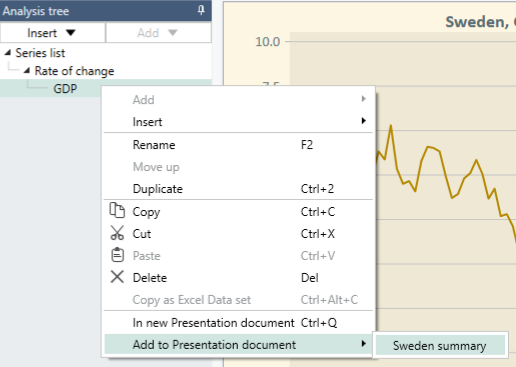 On the context menu of a chart you can select Open in analytics or Ctrl+Double Click, in order to open the linked document in the main application window. You can use charts opened from charts embedded in Office documents or from a historic document revision in a presentation document, but note that these charts can only be displayed as a single chart, and used until the window is closed. They cannot be combined with other charts, in a folder or page, and they cannot be saved. The way your charts are displayed can be adjusted in the Home view of the menu bar, using the Layout, Zoom and Scale to fit options. Selecting a zoom factor for all charts on a page will adjust the scale of the charts. For example, by setting a zoom factor below 100, such as 75 or 50, the charts will be displayed as thumbnails in the page. To see all bar charts in the provided space, select Scale to fit, by clicking on the square icon (highlighted in blue above). This setting is also available from the Defaults view in the tool bar and can be set in a stylesheet. The Style sheet settings for your presentation documents are defined in the Macrobond application, under the activity Style sheets. You can define settings for the pages of your presentation documents, such as text styles and background color. To apply these settings, click on Style sheet in the Presentation documents toolbar. Please note: This refers to the settings of a given presentation document and not the charts in the presentations, which have their own stylesheet settings. 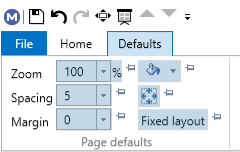 You can define a standard layout for an entire presentation by using the Defaults tab. Settings defined here will be applied to all pages and folders of the current presentation document. In contrast to Style sheet, which can be reused across multiple presentation documents, the default settings are specific to each presentation document you create. As such, if you wish to use a default style across all pages and folders of a document, you will have to set up default settings every time you create a new document. Use the pin button to override the default style settings. This allows you to use a standard style across an entire document, but change the settings for specific pages where needed. To make use of this function, type the relevant values into the fields you would like to change. Then click on the pin to lock the settings and override the default. Pin buttons are located both in the Home view and Defaults view of the tool bar.